The Fellowship was fortunate enough to obtain a copy of PLUTONA #1 from Image Comics. Emi Lenox and Jeff Lemire write, with art by Lenox and colors by Jordie Bellaire. Mie is a pretty normal teenager, frustrated that she’s responsible for her little brother Mike. She’s got friends, though – Diane, who she domineers a little; Teddy, who’s the quiet, bookish type; and Ray, who’s the tough kid with problems at home. And life is pretty normal for them all, until Mike wanders off from the group. And that leads to the discovery of a very important missing person. The thing about this book that I found very striking is how realistic the characters are. This issue is a serious master class on how to set up four very different, very real characters. It’s also cool that it’s a (spoiler) superhero book, given how unlike the usual four-color affairs it is. The art contributes a great deal to that non-superhero feel, with awesome everyday scenes of life and nicely muted colors. There’s a very cool, interesting story here, and what happens next is anybody’s guess. Oh, and the bonus story is fantastic, too. So pick this one up today. 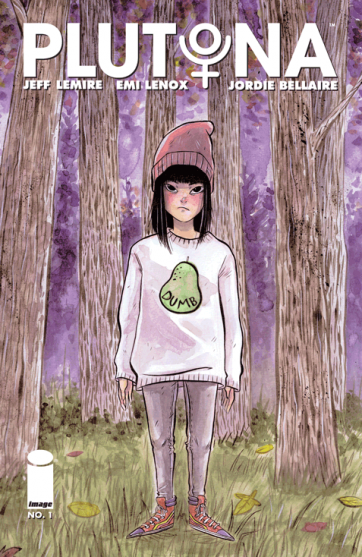 PLUTONA #1 is available now at your FLCS or at imagecomics.com.